Is Faster Always Better When it Comes to Food Processing? When it comes to food processing and manufacturing, time is of the essence. The faster your facility operates, the more products you can output, which means elevated revenues and happier customers and distribution partners. Faster production may be better for your organisation’s bottom line, but the challenge for companies in the food industry is increasing production speed without compromising quality, a situation that could damage a company’s reputation. Fortunately, there are several solutions available to help food processing companies increase their production speed in a safe manner that meets all pertinent food regulations. Faster production means greater overall productivity, but it also means less attention can be given to each individual unit of food. 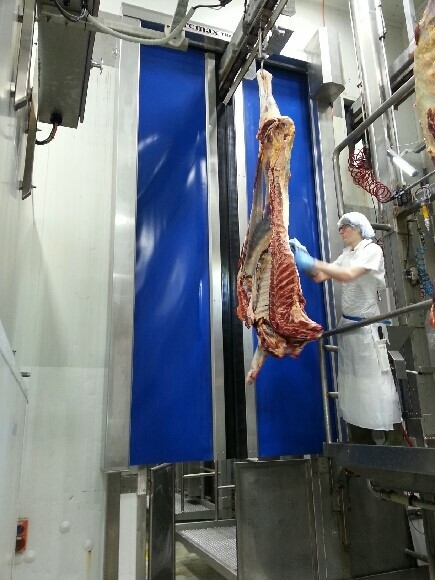 In order to compensate for this reduction, companies need to have a way to keep foods in the proper condition while they move through the processing facility at higher speeds. This is especially important for foods that are highly sensitive to temperature, such as meats, dairy products, and frozen foods. For a real-life example of the risks involved with increasing food production speed, we can look to the United States Department of Agriculture’s (USDA) recent ruling on production speeds in the U.S. poultry industry. A proposed revision to existing USDA guidelines would have allowed manufacturers to increase poultry processing speeds from 140 birds per minute up to 175 per minute, a 25% increase in processing speed. However, concerns over this plan’s effect on worker safety, as well as the ability of poultry companies to shoulder the additional inspection burden, led to the USDA denying American poultry companies the ability to increase production speed in this manner. It’s clear that the United States government felt that poultry companies would not be able to handle the risks posed by increasing production speed, despite the fact that these increased speeds would have allowed for much greater output from poultry facilities. Besides the issues of worker safety and keeping up with inspection requirements, the other big challenge of increased food production speed is maintaining an acceptable temperature. Guidelines from the Australian Food And Grocery Council state that chilled foods have to be kept between 0°C and 4°C without ever reaching a temperature above 5°C, while frozen foods can never reach a temperature above 18°C. The problem with increasing speed as it relates to temperature regulation is that faster production generally means more motion from equipment like conveyor belts and more frequent opening of facility doors that are used to regulate temperature. If these openings are not controlled, they could eventually lead to a warmer freezer or a production floor that puts food that must be chilled in danger of contamination. The beef industry in Australia is particularly at risk of problems related to contamination as a result of meats that are handled the wrong way. This sector is highly sensitive due to its important role in the global beef supply. Australia has a relatively small cattle herd compared to larger countries like the United States and China, yet our country’s relatively low population and consumption of beef products makes us a world leader in global beef exports. PricewaterhouseCoopers reported that Australia produces only 3.9% of the global beef supply, but because over 60% of that supply is exported Australia is one of the three biggest suppliers of beef in the world, along with India and Brazil. There’s already a precedent of trouble with Australian beef: in early 2013, the United States reported numerous incidents of contamination with meats imported from Australia. Australia’s dependence on exports means that it is especially important for beef companies to keep their products safe, even as they look to improve production speed to maximize revenues. So, what can food companies do to make sure they avoid the dangers associated with contaminated products? The answer lies in obtaining sophisticated food processing equipment that can meet the speed requirements necessary for profitable production while keeping food safe. Consider the case of the new George Weston Foods facility in Castlemaine, Victoria. 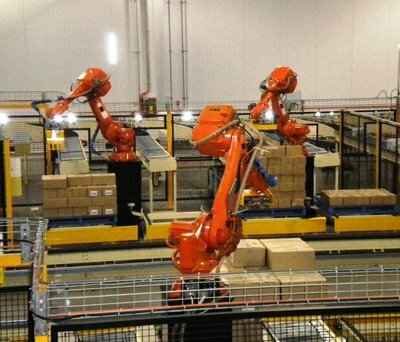 The facility is equipped with 16 robots produced by the global industrial robotics company ABB. These machines are able to collect about 9000 cartons per hour. GWF executive Troy Thomas reported that previous methods of manual handling had led to excessive downtime, slower speeds, and higher costs. 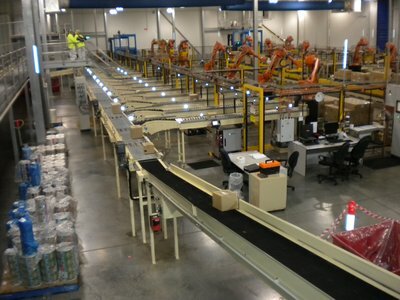 With over 60 Remax high speed doors installed in this facility, the robots operate seamlessly through various controlled temperature and hygiene zones, with full integration between robot and door. There are plenty of solutions available for food manufacturing and processing companies to help your business improve production speed while maintaining a safe operation. A critical aspect of increasing output speed in a production facility, is ensuring hygiene zones and check points are also sped up. Where segregation needs to be maintained between varying production or temperature zones, a slow or manually operated door or screen can create a costly bottleneck in your traffic flow. Fast opening and closing automatic high speed doors, along with smart sensing systems such as radar and infrared sensors, can dramatically improve traffic speed and safety through critical doorways. With the right equipment, an efficient approach to production channels, and a willingness to invest in facility upgrades, it’s possible to make sure that your food manufacturing operation can sustain the necessary speeds without endangering the products that you send out to customers. Read about Remax Ulti-Flex doors installed at Greenhams in Victoria.